2011 Baileigh mdl. BB-9616M 96” x 16GA 6-Ton Magnetic Box and Pan Brake s/n A1114935 w/ 102” Bed Length, Back Gage. 2013 Baileigh / RMD mdl. RH19 Metal Former s/n 37899762 w/ Adjustable Hammer Rate, Tooling. Custom Pneumatic C-Frame Metal Former w/ 31 ½” Throat. VanSant “Metal Ace” mdl. 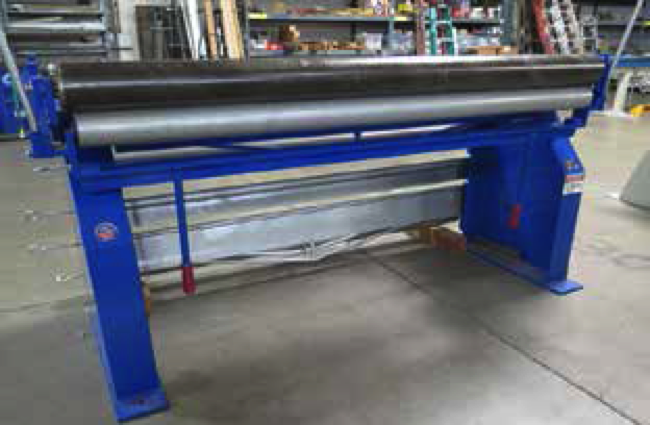 RB7216 72” x 16GA Sheet Metal Rolling Brake w/ 4”, 3”, 2 ½”, 2” and 1 ¼” Roll Dies. 2011 Baileigh mdl. HB-9612 96” x 12GA Box and Pan Brake s/n 25166 w/ 97” Bed Length. 2012 Baileigh mdl. SBR-5216 52” x 16GA Shear/Brake/Roll s/n F12090251 w/ Back Gage, Stand. Tennsmith mdl. T52 52” x 16GA Kick Shear s/n 14764 w/ Back Gage, 24” Front Supports. DiAcro 12-Station Turret Punch s/n 1-1212 w/ 1/8” to 1 ½” Punch Cap. DiAcro 6” x 6” Corner Notcher w/ Stand. Toyota 5FGC25 5000 Lb Cal LPG Forklift s/n 5FGC25-12321 w/ 2-Stage Mast, 130” Lift Height, Side Shift, Solid Tires. Dillon ED-Xtreme 2500 Lb Cap Digital Crane Scale. Chromoly Tube Stock, Aluminum Sheet Stock, Aluminum and Cold Roll Bar and Tube Stock. Horizontal and Vertical Material Racks. (9) Sections of Pallet Racking. Misc Office Cubicles and Furniture. LeBlond 19” x 80” Geared Head Lathe s/n 6E290 w/ 40-1600 RPM, Taper Attachment, Inch Threading, Tailstock, KDK Tool Post, 12” 3-Jaw Chuck. Bridgeport Vertical Mill s/n 69457 w/ 1Hp Motor, 80-2720 RPM, Power Feed, 9” x 42” Table. Jet mdl. JSG-6DC 6” Belt / 12” Disc Sander w/ 1.5Hp Motor, Stand. 2012 Baileigh mdl. DBG-106 6” Belt / 10” Disc Sander s/n A12080253 w/ Stand. Clausing Variable Speed Drill Press and Dayton 20” Bench Model Drill Press w/ Table. Dayton 20” Pedestal Drill Press. Craftsman 12” Radial Arm Saw. Miller Syncrowave 210 AC/DC Arc Welding Power Source and Wire Feed w/ TEC Cooler. Miller Diversion 180 Arc Welding Power Source s/n MD310081J w/ Cart. Lincoln 180 DUAL Power MIG Welding Power Source s/n M3130703101 w/ Cart. Acme Type 1-18- 10 20kVA x 22” Spot Welder s/n 2928. (2) Lincoln Magnum PRO 100-SG Spool Guns. 2010 Kohler Power Systems Type 20REO21 26kVA Diesel Generator w/ Kohler DEC 1000 Control System,480V, 60Hz, Mitsubishi 4-Cylinder Diesel Engine, Sound Enclosure, Spill Containment Base, Less than 1 Metered Hour. AVL High Precision Fuel Flow Metering System for Engine Research. AlienTech “KESS V2” Slave Version Automotive ECU Reading and Writing Unit. LDS Nicolet “Sigma 60” Digital Oscilloscope Workstation. Control Company Traceable Digital Thermocouple. Automotive Engines, and High Performance Accessories. Body Forming Tools and Slide Hammers. Engine Hoists, Lifts and Stands. Craftsman Professional Roll-A- Way Tool Boxes w/ Craftsman and Snap-On Tools. Milwaukee 18Volt Portable Band Saw and Angle Drills. DeWalt Cordless Angle Drills, Drills, and Reciprocal Saws. Electric Grinders, Straight Shaft Grinders, Drills and Saws. Electrical Wiring, Cable Connectors, Crimping Tools and Misc. Portable Swamp Cooler, Propane Heaters and Shop Fans. Brown &amp; Sharpe 0-3” OD Mic Set. 24” x 36” x 4” Granite Surface Plate w/ Roll Stand. 2012 Ford Super Duty F250 Crew Cab Pickup Truck Lisc# 32756E1 w/ 6.7L V8 Diesel Engine, 6-Speed Automatic Trans, XLT Premium Package, Tow Package, Chrome Package, AC, 9,900 Original Miles, VIN# 1FT7W2AT2CEH21683. 2010 Audi Q7 TDI Quattro SUV Lisc# 6LME154 w/ V6-3.0L TDI Gas Engine, Automatic Trans, Leather Interior, 3 rd Row Seating, Fully Loaded, Media Capability, Rear Climate Controls, AM/FM/CD/6-Disc CD Changer, AC, 48,940 Miles, VIN# WA1CMBFE8AD002812. 2002 Isuzu / GMC W4500 15’ Stake Bed Truck Lisc# 6Y93146 w/Gas Engine, Automatic Trans, AC, Lift Gate, Side Storage Boxes, 123,050 Miles, VIN# 4KDC- 4B1RU2J801999. 2000 Chevrolet C6500 Flatbed Tow Truck w/ Diesel Engine, Automatic Trans, Vulcan 21’ Roll-Back Deck, Dual Fuel Tanks, Side Storage Boxes, Safety Lighting, 222,361 Miles, VIN# 1GBJ6H1C9YJ509418.